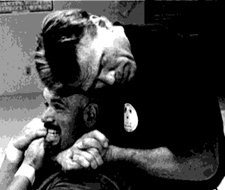 Don Draeger, a famous martial arts author, called judo "the great crippler." The same could be said of wrestling and any other grappling-based martial art that involves throws and takedowns. One of my former judo coaches, a silver medalist in the 1967 World Championships, commanded me to do bench presses and Squats only. "Nothing else!" he barked. Oh, I was allowed to do push-ups, sit-ups, pull-ups, and various jumps, but as for my weight work, those two exercises formed almost the entire program. It wasn't long before I had two shoulder separations and ligament tears in both knees. Add to that constant back pain and you have a pretty bleak picture. I've spent the rest of my life trying to strengthen and heal those injury sites. In April 2003 at the U.S. National Judo Championship in Cleveland , Ohio I saw many of my old friends for the first time in over a decade. The story was even worse for some of them who had long since retired from competition: double hip replacements, knee replacements, multiple shoulder surgeries, totally screwed-up backs, and on and on it went. "There's got to be a better way," I thought to myself. Since I recently released a book, Strength and Conditioning Secrets Of The World's Greatest Fighters , on that "better way," I'll confine my comments to injury prevention, and to some of the equipment your club or dojo should have to help you remain injury-free and achieve superior strength and conditioning for your art. First of all, the big injury sites in grappling-based arts that involve throws and takedowns are knees and shoulders. Whatever else you do, make sure you include exercises for these areas in your routine. In the United States most martial artists tend to get in shape solely through the practice of their martial art. In the former Soviet Union , on the other hand, all potential judoists, SOMBO wrestlers, and wrestlers are given special exercises for their sport before engaging in the actual competitive activity itself. As Dr. Steve Fleck, the former head exercise physiologist at the Olympic Training Center once told me, "you can't just play your way into shape." Now, not all dojos and clubs are ideally equipped to help you get in shape for your art, and this of course is the big problem. If your club doesn't have the equipment you need, I recommend that you save up and get what you need, one piece at a time. This is what I did at my Barn Of Truth training facility in Perrysville , OH . I started with the bare essentials and added a piece at a time as I could afford it. Better yet, hold fundraisers at your club to get the equipment you need. To lead and show students the way. In the words of Emerson, "To give you must first have. To teach you must first know." In Shingitai we offer a number of seminars, camps, and instructional DVD's and books to help you increase your knowledge as a student, teacher, or coach. See the rest of this site for information. This is the first step in injury prevention. Bad mats are responsible for many debilitating knee and shoulder injuries. Also, a good crash pad will allow you and your training partners to do high reps on your throws and takedowns without the usual wear and tear of falling on harder mats. Talk to my friend Mike Swain, owner of Swain Mats. Mike is a world champion in judo and a former U.S. Olympic Coach. He's also an all-around great person who stands behind his products and his promises. Any dojo that incorporates striking arts needs these items. If you can't afford all of these at first, start with the Thai Bag. It can be used for all kicks, knees and can double as a heavy bag for hand strikes. Also, make sure you have hand wraps, bag gloves, and mouthpieces to prevent injuries. I purchased all of this equipment from Ringside , a very reputable company. Also designed by Louie Simmons, this machine can be used to strengthen all kinds of muscle groups essential for combat arts, including the often neglected rotational muscles which are so important for throws, takedowns, kicks, and in preventing back injuries. * Note : 2 Olympic bars and Olympic-style weights are required to use "The Grappler". The pulling sled will help you strengthen the entire posterior chain of muscle groups: low back, glutes, hamstrings and calves. Simply hook the strap around a weight belt or tool belt while taking long strides forward, tow the sled. You can also face the sled and pull it alternating one hand at a time, or both hands at once, in a rowing motion to develop tremendous pulling strength which is essential in grappling. This Power Rack, designed by Louie Simmons, is one of the strongest on the market. It allows you to perform Squats, Good Mornings, Benches, and a variety of other movements in complete safety. The rack also comes with a sturdy Flat Bench for performing Bench Presses and other movements. Designed by Louie Simmons, this is simply the best machine around for strengthening the lower back, glutes, and to a lesser extent, the hamstrings. It not only strengthens the lower back, but it also serves as restoration and rehabilitation by opening u pthe disks and actually allowing fluid to re-enter at the completion of each downward swing in the motion. These pieces will go a long way towards helping you develop super-human strength and conditioning. Check out my book, Strength and Conditioning Secrets of The World's Greatest Fighters , to learn how to incorporate these items into your routine. Kettlebells can be used to build your strength through a variety of movements. They are also great for developing the stabilizer muscles and the thick handles will help you develop a superior grip. Well, there you have it. I'm sure there are many other pieces of equipment that could help you, but these are the ones I have found to be most beneficial for martial artists and fighters of all type. Some of these machines are not cheap. Quality never is. Again, start by getting one piece at a time as you can afford it. Or have your club run regular fund-raising events to raise money. These items will pay you dividends in strength, conditioning, injury-prevention, and rehabilitation for years and years to come.